Torkapparater has worked with sludge drying and sludge incineration for more than 50 years. The indirect drying principle is especially suitable for sludge drying and the system design is continuously developed in order to comply with increasing environmentar constraints in this field. In order to treat odours and the release of hydrocarbons we use a high temperature process in order to incinerate all waste streams. Torkapparater supplies different techniques to treat all types of sludges, also difficult municipal and biosludges that have a tendency to clogg after mechanical dewatering. With our technology dried sludge is recirculated and admixed with the wet feed at the dryer inlet in order to avoid clogging. Torkapparater has a complete sludge dryer in stock for direct delivery! Please contact us for more information. Himmerfjärdsverken south of Stockholm dry municial sewage sludge with flue gases generated from digester biogas combustion. SCA Edet Bruk dry deinking sludge with medium backpressure steam from a turbine. Both clients use our indirect tubular dryer that ascertains a safe operation also with varying sludge conditions. A small ventilation flow creates a compacts plant design for heat and dust recovery. Remaining odorous ventilation is combusted as combustion air in order to minimise smell and dust emissions. 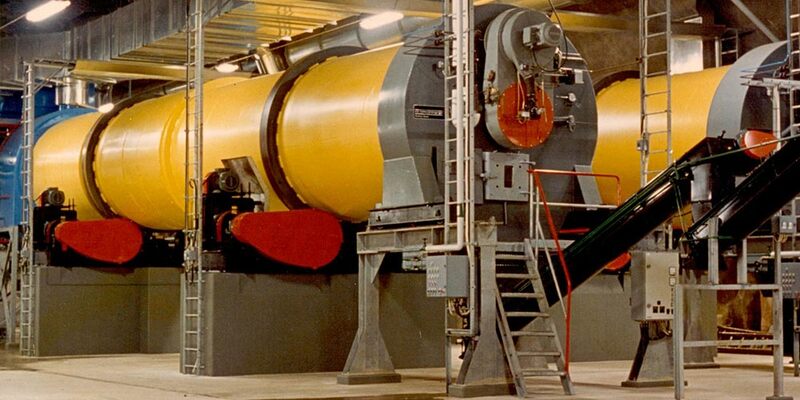 1950: One of Torkapparater’s first project is to design a sludge dryer for Sandins Ingenjörsbyrå. 1960 Sludge incineration plants from north to south. From Piteå, Luleå och Umeå to Himmerfjärden, Sickla Strand and the recovery centre Lövsta, Stockholm. 1970 Drying systems for Sweden, Denmark and Hungary. 1974 Patent on activated carbon production from sludge. 1980 Process for the production of activated carbon from sludge. 1990 Sludge dryers to Norway and Scotland. 2000 Pulp and paper sludge drying at Rockhammar, Sweden. 2002 Vacuum drying for ÅF with several pulp and paper sludges, Sweden.